When I was a child, my parents used to “threaten” to feed me Brussels sprouts whenever I misbehaved. This generally sobered up my behavior pretty quickly; but had I known how healthy and beneficial Brussels sprouts are, I would have misbehaved on a daily basis! Deriving from the same plant family as the cabbage—and very popular in Belgium—Brussels sprouts may not be a favorite for many kids, but this leafy, green bud provides a host of essential nutrients for the body. The nutrients found in Brussels sprouts provide key support for three body systems that are directly linked to cancer development: the detox system, the antioxidant system, and the inflammatory/anti-inflammatory system. If there is an imbalance in any of these systems, the risk of developing cancer significantly increases. • Brussels sprouts have cholesterol-lowering benefits. In order to get the full benefit from the sprouts, try steaming them instead of eating them raw. When steamed, the fiber that is found in Brussels sprouts binds more effectively with the bile acids in the digestive tract. The binding process makes it easier for bile acids to be excavated, and it results in lowering your cholesterol levels. • According to The World’s Healthiest Foods, a recent study proved that the DNA stability in our white blood cells improves after consuming 1.25 cups of Brussels sprouts on a daily basis. • Brussels sprouts are high in rich nutrients—they have high levels of vitamins C and K, as well as folate, manganese, iron, protein, magnesium, vitamin B, dietary fiber, copper, potassium, and omega-3 fatty acids. 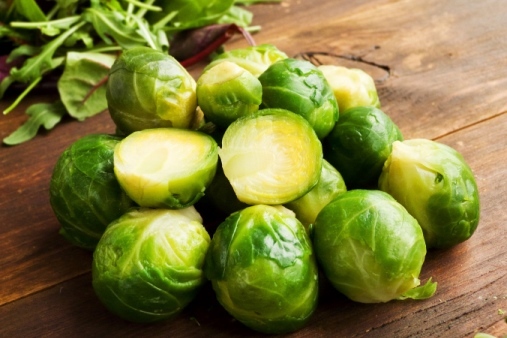 The enzyme systems in our cells that are required for body detoxification can be triggered by compounds made from glucosinolates, which can be found in Brussels sprouts. Furthermore, in order for our detox systems to work efficiently, they need a large amount of sulfur. Fortunately, Brussels sprouts are high in sulfur-rich nutrients. Finally, our detox systems require support from antioxidants—Brussels sprouts are rich in vitamin C and other antioxidant phytonutrients. Brussels sprouts contain many beneficial flavonoid antioxidants, such as isorhamnetin and quercetin, as well as vitamin antioxidants, including vitamins A and C. One study conducted in France discovered that Brussels sprouts are a more important dietary contributor to antioxidant polyphenols than any other cruciferous vegetable, including broccoli. The antioxidant nutrients from Brussels sprouts support all of the body’s cells that are at risk of oxidative damage (which occurs when there is an imbalance between the production of free radicals and the body’s ability to detoxify their harmful effects.) Constant oxidative stress and damage to the tissue from the reactive oxygen molecules is a major risk factor in most cancer cases. Unwanted inflammation can be caused by a number of issues, including exposure to environmental toxins, overuse of prescription drugs, stress, lack of exercise, and lack of sleep. By consuming Brussels sprouts, our bodies can ward off chronic inflammation. Since Brussels sprouts are rich in glucosinolates, consuming them can help prevent inflammation. There are four grams of fiber for every one cup of Brussels sprouts—meaning you can get half of your suggested daily fiber intake from a 200-calorie serving of Brussels sprouts. Furthermore, the sulforaphane that is made from Brussels sprouts will help protect the lining in our stomachs by preventing bacterial overgrowth. Let’s take a look at some homemade Brussels sprouts recipes that will give your body the nutrients it’s desperately craving. 1. Start by preheating the oven to 200⁰C/400⁰F. Toss the carrots, parsnips, and onion in the oil and begin to season. After seasoning, roast for 30 to 40 minutes. 2. While the carrots, parsnips, and onions are roasting, grab a griddle pan and heat on high. After the pan is heated, toss the sprouts in and add some oil. Griddle them until char marks appear. 3. For the aji sauce, combine all of the ingredients in a food processor; add a dash of salt. If you wish, play around with the flavor—add vinegar or sugar to get the sweet and sour taste. 4. Once the sauce is made, the vegetables should be finished roasting; place them on a platter and pour the fresh sauce all over them. 1. Wash the sprouts and dry them thoroughly with paper towel. 2. Mash the goat cheese with the olive oil and grain mustard. Add milk until there is a thickness to the goat cheese. Season it with salt. Conduct a quick taste test to ensure all the flavors have been mixed well. 3. Preheat the stove to 340⁰F and deep-fry the sprouts until the outside leaves turn golden brown. 4. Drain the sprouts and season with salt. 5. While the sprouts are soaking in the salt, begin to wash and prepare the parsley. 6. Place the sprouts on a large plate and arrange the goat cheese, parsley, and chili flakes over top of the sprouts. 1. Mix the water and salt into the saucepan and set it to boil. Place the sprouts into the saucepan and cover until the water begins to boil. Once the water is boiling, remove the cover and let the sprouts cook for about six minutes. 2. Drain the sprouts until they are dry. If you do not plan on serving them right away, place them under cold water to keep them fresh. When you’re ready to serve them, drop the sprouts into boiling, salted water for a few seconds. 3. If you are serving them immediately, roll the sprouts gently in a lightly-buttered pan before seasoning them with salt and ground black pepper. High-quality Brussels sprouts are firm, compact, and extremely green. Avoid sprouts that are yellow or have wilted leaves. They should never be soft or puffy. Make sure they are relatively the same size so they cook evenly. When I store my Brussels sprouts, I always place them in a plastic bag and stick them in the vegetable section of my refrigerator. Keep them in the refrigerator for no more than 10 days. Hunt, T., “Our 10 best brussels sprouts recipes,” The Guardian web site, December 20, 2014; http://www.theguardian.com/lifeandstyle/2014/dec/20/our-10-best-brussels-sprouts-recipes. “Brussels sprouts,” The World’s Healthiest Foods web site; http://www.whfoods.com/genpage.php?tname=foodspice&dbid=10, last accessed May 26, 2015.